The Trial for the above teams, will be held on 4th April @ 7:00pm in Castlewellan. The U17 Trial will consist of a 5km race with approximately 300 ft of climbing on forest paths. The U20 Trial will consist of a 10km race with approximately 1000ft of climbing on forest paths. Both Trials will use the races being hosted by St Malachy’s High School, Castlewellan, where the Junior Team Manager, Phil Hodge is a teacher. This is the 10km route. The 5km follows the same path until 4km, at which point it drops down to the lake path and follows the lake round to main the carpark and finish. 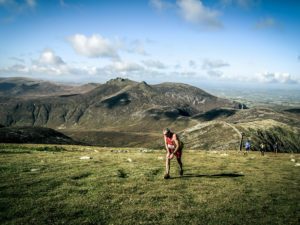 The key event for 2019 is the British & Irish U20 and U17 Mountain Running Championships. At this event last year Grace Carson was crowned current U20 British and Irish Mountain Running Champion. On the same day Sorcha Mullan gained an Individual Bronze at U17 and the U20 male team managed a team Bronze. To help the squads prepare, it is hoped to attend three training camps throughout the season. These trials will select the athletes that will compete at this Championship and prepare at the training Camps.